To start, select the ‘Add Animation Points Tool’ (shortcut D or V). Simply click and drag in the direction you want the image to move. Continue doing this with all the areas you wish to move, bring the animation tracks to the parts of the image you want to animate. Adjust animation points using the selection tool. 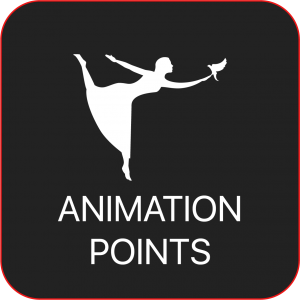 Click and drag on the end (arrow side) of the animation point to change the direction and length of the points. To change the beginning of an animation point hold the ‘M’ key, then click and drag to the desired spot. There are multiple ways to delete an animation point. The first way is to go to the ‘Delete Animation Points Tool’ (shortcut Alt+D or Alt+V), then click on either the beginning or end of the point to delete it. Additionally, right clicking on a point can delete it. Lastly, using the ‘Direct Selection Tool’ (shortcut A) or the ‘Lasso Selection Tool’ (shortcut J) allows you to highlight one or multiple points at a time (including stabilizer points) and then delete them by hitting the ‘Delete’ key. Using the ‘Direct Selection Tool’ or the “Lasso Selection Tool’ allows you to highlight and move multiple points simultaneously. Click and drag (or draw around) the points to highlight them. Then adjust the length and direction of one point and all the highlighted points will follow!